Babysitting Mama is an innovative simulation game for the Wii that is delivered with an adorable plush baby doll in a keepsake cradle. Use the plush baby as your controller and follow Mama's movements on screen to care for your little one. With Mama's help you can become the greatest babysitter on your block! A Whole New Way to Play with Your Wii! Babysitting Mama, the latest release in the best selling Cooking Mama franchise, is the first game that lets you play with a Wii game and interactive baby together! 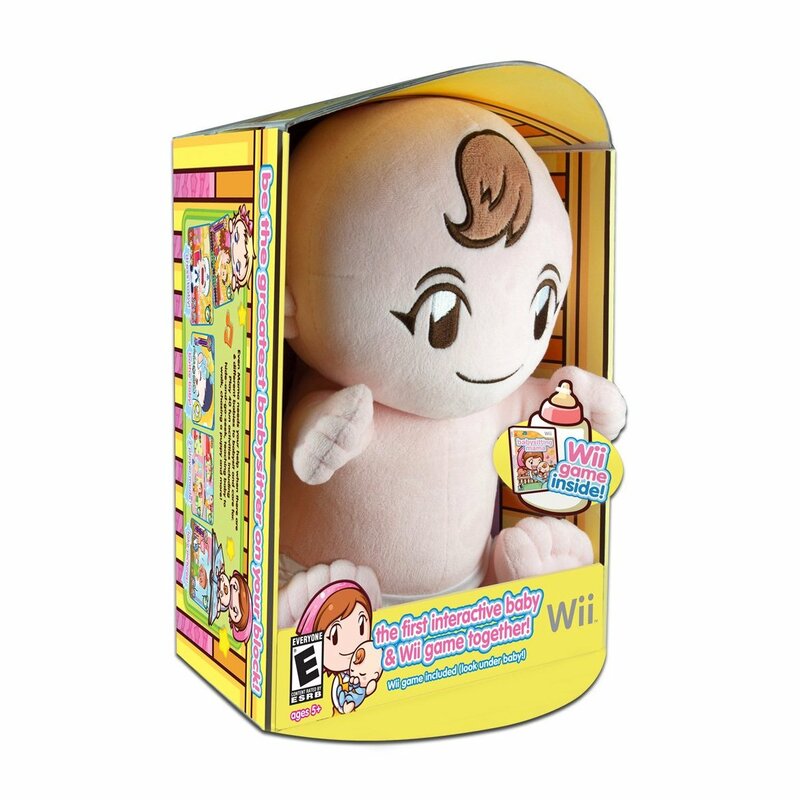 First, tuck the Wii Remote into the back of the plush baby included with the game. Then, use your plush baby and Nunchuk to play more than 40 activities, from feeding, changing and playing peek-a-boo, to racing your baby through an obstacle course! 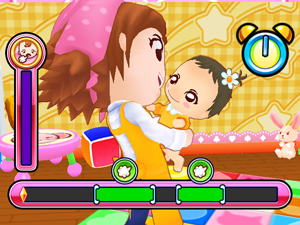 Mama makes her babysitting debut in Babysitting Mama, a Wii game that is a one-of-a-kind play experience. When you tuck the Wii Remote into the back of the plush baby included with the game, the baby itself turns into the controller. Enjoy over 40 different activities, from feeding, changing and playing playing peek-a-boo to rocking the in-game baby asleep as you rock the plush baby in your arms. 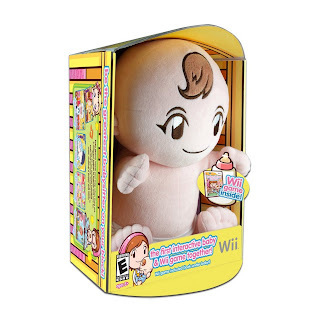 The plush baby also "comes to life" as cries and coos play through the Wii Remote inside the baby, making it seem as if the baby is responding directly to your care. The game features six unique babies, each with his or her own personality and needs, along with a range of indoor and outdoor environments that Mama and baby can play in together. The game also supports two-player mode and when the game is off, you can continue to play with the plush baby and even the adorable cradle packaging. With the cold weather in full force, we've been spending most of our time inside. I occupy the kids with crafts, worksheets, various indoor activities, and our favorite FUN way to get up and moving is to play some games on the Wii. We recently had the opportunity to check out the all new Babysitting Mama game for Wii, and in 3 words.... Unique & SUPER FUN! Babysitting Mama comes boxed in a adorable cradle with a Baby & the Babysitting Mama game (pictured above top). Simply slide the Wii remote into the back of the baby, and select from the menu of activities. The princess and B had fun "feeding the baby" & "rocking/soothing the baby". To my surprise, Babysitting Mama really does encourage little ones to be gentle and caring! Overall?Great fun! Become the best babysitter on the block with Babysitting Mama! Visit http://www.babysittingmama.com/ for more information & to find a retailer near you! Become the BEST Babysitter on the Block! One Lucky Reader will receive Babysitting Mama for Nintendo Wii! Visit http://www.babysittingmama.com/ and let me know which feature you think your little one will enjoy most with the Babysitting Mama game for Nintendo Wii. The comment is considered your entry. 2) Tweet ~Become the Best Babysitter on the Block with Babysitting Mama for #Nintendo #Wii ! #Win @savvycouponmom http://bit.ly/h0JngR #Giveaway (can be repeated twice daily for additional entries~ copy paste please~cut and paste- the bit link must be posted in the tweet - I will check) (Additional 5 Entries - 5 Comments). they have a cute & fun web site! She will enjoy using her & teaching her to walk and i saw that she can play peek a boo & other fun games with her. My daughter would like to learn tips on how to be a better sitter and be more caring towards other children. I follow you from GFC. I'm not sure if the email I get is your newsletter so I won't enter that. I love that you can play games and not only 'babysit' the baby. will give her some when she starts babysitting. I like that it can take pictures! my 9 yr old would love this! GFC follower, she would love the 40 different activities you can do with it and the fact that with the controller in the baby, it sounds as though sounds made are coming from the baby.